So…it turns out neither of them is the coolest Jewish rapper. But what’s cooler than a Social Network reference? Five million dollars, which is what Forbes says Mac Miller earned last year, on top of a cool $6.5 million the year before that. 2011’s Blue Slide Park was the first independently-distributed debut album to hit number-one on the Billboard 200 since 1995, the second ever in history. His follow-up, the decidedly un-pop Watching Movies with the Sound Off, came out this year. It sold over 100,000 copies its first week, landing just behind Kanye and J. Cole on the chart. Critics went from rejecting to accepting him. (Pitchfork, which slammed Blue Slide Park with a 1.0 rating, gave Watching Movies a glowing 7.0.) With no one to answer to, Mac&apos;s only getting bigger, weirder and better. In a whirlwind of responsibilities, there was the tour with Chance the Rapper, the ads with Lil Wayne and Mountain Dew, and the casual two-step he did with Ariana Grande on Ellen’s show. He’s moved out from behind Wiz Khalifa’s shadow and into his own cloud of smoke. Not too bad for a Big L fan from Pittsburgh. And sure, he has no major label to share his money with. But he’s got friends: the hilarious Most Dope Family, as seen on MTV2 and in the hills of Hollywood. (Other friends? The OFWGKTA biker gang and Miley Cyrus.) He’s a 21-year-old with the world at his back and tattoos on his chest, fingers, neck, legs—and now his stomach. He’s living! That’s great, since he won’t be able to be buried in a Jewish cemetery. 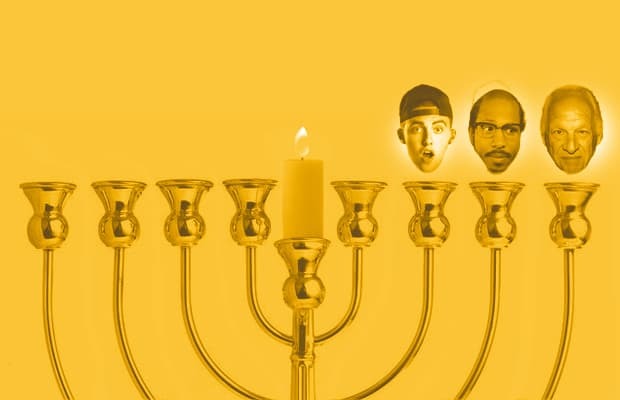 Check back tomorrow for our next great Jew of rap.